Yesterday I was interviewed on the streets by a TV station about the Holiday weekend. Members of our group were quite surprised to see me on the news at 6, 10 and the next day as well. Last night was the conference banquet and the band that was playing was “graced” by Lou Diamond Phillips, who sang much worse than most contestants at a Karaoke bar. He did particularly painful versions of Desparado and Luckenbach, Texas. We then found a Texas blues, Stevie-Ray Vaughn band the Eric Tessmer Band at a club downtown and ended the late evening at an improv jazz club. 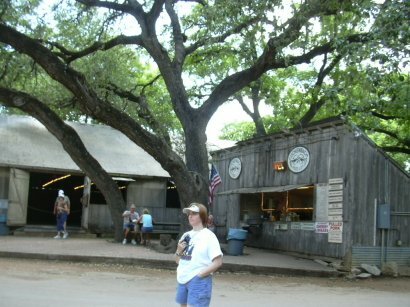 Today Linda’s at the conference, so it was off to Luckenbach, TX. I was surprised that it is not really a town. It looks like a set from on old western town, with only an old open air dance hall, general store with the emphasis on “rustic.” It is more like someone’s run-down ranch/summer camp, with lots of bikers sitting around drinking and listening to some guys play guitar. I can see how it is a place you may expect to see Willie Nelson at – it couldn’t be more laid back and less commercial. Here’s the feed shack and dance hall. 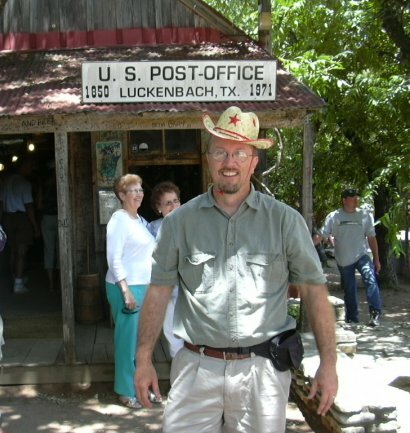 Here I am with Martin’s cowboy hat in front of the general store. 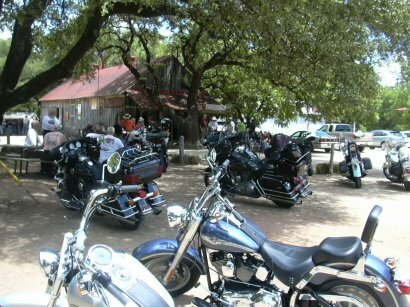 Here’s some of the bikes and the general store. We ate lunch in Fredericksburg – our waitress was wearing shirt with “inmate” on the back. A manager came out and yelled at her that she wasn’t wearing her ankle bracelet and her parole manager needs a call immediately. 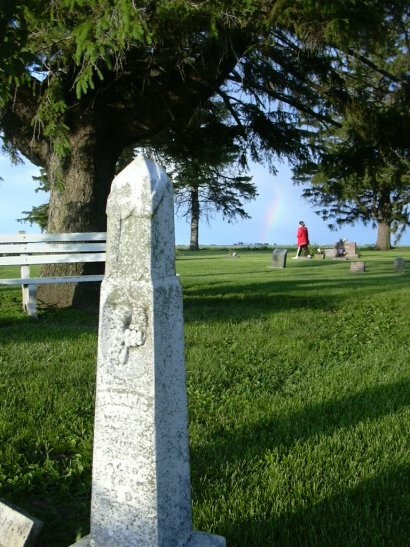 There’s a township cemetery about 2 miles down our gravel road. It’s on a rise and you can see the trees on our farm from there. 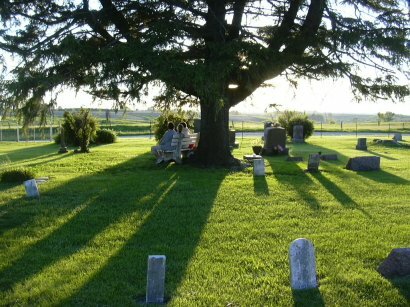 There are some old graves, some unreadable with many from the 1800’s. There’s an old house to keep people warm in the winter. 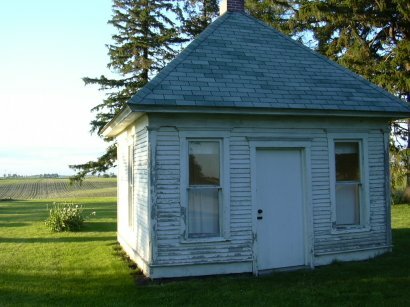 The house remains unlocked (one of the country charms). 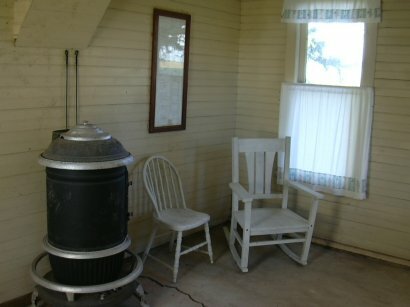 Inside is a wood stove, some chairs and you can see a framed map of the cemetery with names and available plots on the wall. 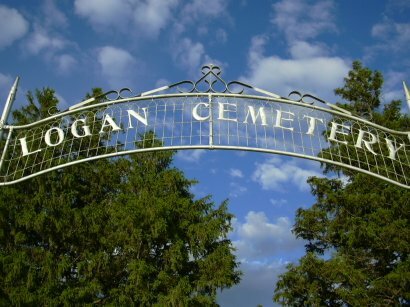 Each year we have a tradition to walk around the cemetery and look at the stones – looking for old ones and being sad at the stones with the infants and mothers dying on the same day or within a week of each other. We then gather on a bench and remember those who have died in the last year and before. This year it was Grandma Ruth and Grandma Eunice (both Linda’s grandparents). Yesterday afternoon we walked in Zilker Park and then met comrades for a Cajun dinner. Jackie has a “Don’t mess with Iowa Either” T-shirt to complement Barbara’s “Don’t mess with Texas” shirt. After dinner we roamed around a bit and settled into a club that had a band that played R&B standards. It was a bit of an odd band. The drummer, keyboard player and base player were old wrinkled black musicians and the lead guitar player looked like he was about 15 years old and was a ringer for a young Matthew Broderick from the “Ferris Bueller’s Day Off” era. About every other song he took a piece of candy (we’re wondering if that was his payment). Today we’re off to the hill country and ???. We have arrived in Austin with only minor difficulty. I am now in the state of Iowa court system. On the drive to the airport in Des Moines, we were pulled over by a state trooper. No, I wasn’t speeding – the front windows of Snowball (who just turned 200,000 miles) are tinted, which is evidently against state law. Now, I’ve driven the car for 7 years and 140,000 miles in the state of Iowa, and only now was stopped! The officer was nice and we had a good time chatting about Wells Fargo and the Boundary Waters. We’re settling in the hotel and ready to leave for the evening soon. As for me, I think I’ll be roaming the streets of Austin, but that’s ok since there’s a strong sentiment to Keep Austin Weird. One of the particularly engrossing pages on the site is a menu from an overly snooty restaurant (I particularly like the entrees, you’ll need to scroll down the page a bit). I’ll try to keep updated from Austin if I can find internet access. 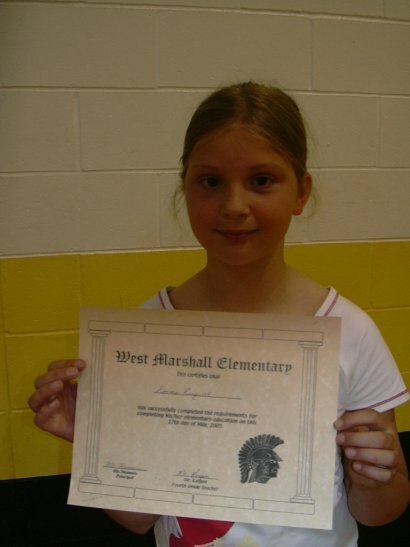 Today was Emma’s graduation from elementary school. Next year she will be in middle school (5th grade in her district). Claire played pomp and circumstance for the ceremony. 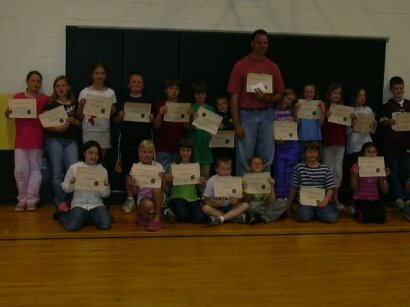 Here’s Emma with her class and diploma! It has been a tradition of sorts to name all of our vehicles. When the kids were younger, the names were simple, like “Golden Car” for the gold Taurus. 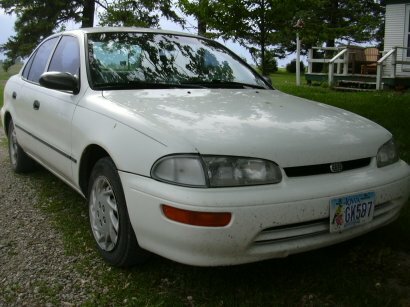 Our current fleet includes Snowball, a 1994 Geo Prizm. Our minivan, a larger white version of Snowball is called Blizzard. The truck is called Deezy in honor of the Dee-Zee accessories adorning it and my late uncle who had initials of D.Z. 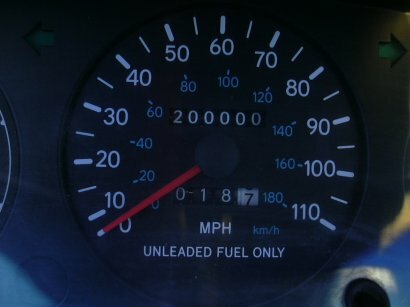 All that aside, today Snowball turned over 200,000 miles on the way to work today. I pulled over marked the occasion with this photo. This is one of those well-meaning projects that drags on and on. Last year we thought it would be great to get Martin a playground with a swing, slide, tower, and monkey bars. 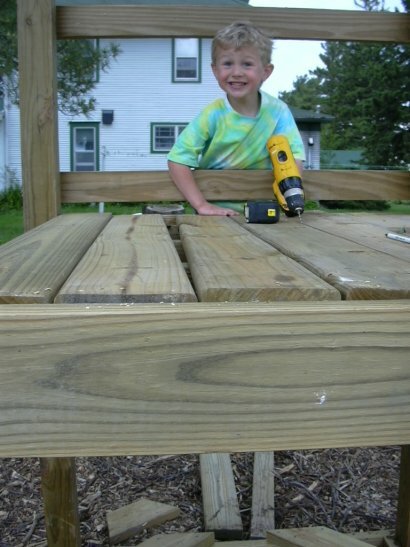 So last June 30, he got the playground in a box – a stretch for a 2 year old to make the jump from the box of hardware and lumber to a playground. 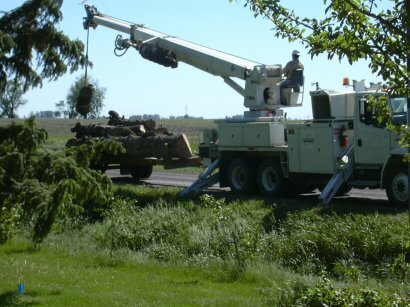 Picking up the lumber was the most weight the truck ever hauled – I was worried something would break the whole way home. 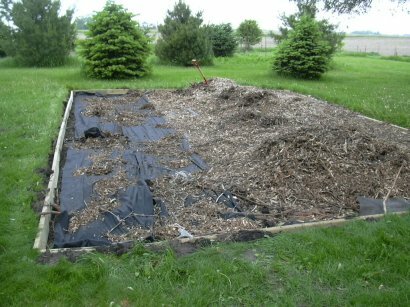 We got some of the pieces together fairly quickly – it was the landing pad that took forever – it was neither fun nor ever a top priority to dig out a 20×30 area six inches deep to place the wood chips (I’ve come to learn to make things at ground level, rather than build up). At any rate, it was about 3/4 dug out by the time the ground froze last winter and this spring is a big gardening and planting time, but I want to have it up by his birthday THIS YEAR. So a burst of digging this weekend and the better part of a day today got the landscape fabric spread, wooden border put in, and wood chips spread. We built most of the tower today. We were in a bit of a quandary trying to tip the tower up with only dad and Martin. 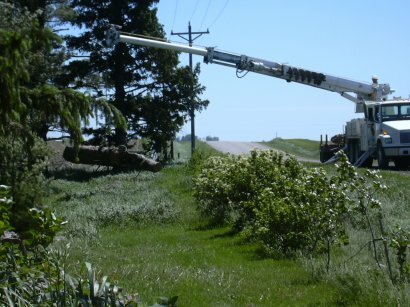 We gambled and won that we could pull it up with the tractor and a chain (the possibilities were the tower would just drag on the ground and not lift up, the tower would lift up and promptly keep going to tip back the other way). The good outcome happened, it lifted and did not tip toward us from the momentum of tipping up. Martin spent most of the day with me, fetching screws, talking non-stop, and asking for the slide to be put up. He seems genuinely excited and must sense it is finally coming together. After I got home from work, it turned into a #2 day for Claire and Emma. First, Blue found a fresh cow pie to his liking and was pretty much covered on one side of his body. His patches of white were greasy grey-brown. Since Emma is the lead caretaker, she had the privilege of washing him. Claire was putting the chickens away and had one that did not want to go home. So she caught it and the universe sensed that it was time to even the sibling score and the chicken did a #2 all over her hand, shirt and legs. She wailed riotously at the injustice of it all to the point that we thought she had been attacked by wild canines. 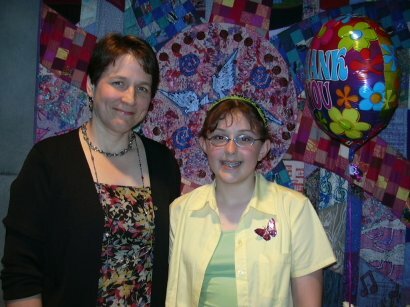 May 22, 2005 – Wonderful Quilt Keepsake! Claire is guest blogging (again). Today we all went out to eat with Molly and her daughter, Erin, after church. Molly gave me a quilt that she made for me as a Coming of Age present. It’s a beautiful quilt that has a lot of meaning to me. She also typed up what it symbolizes. I will share some of what it said. 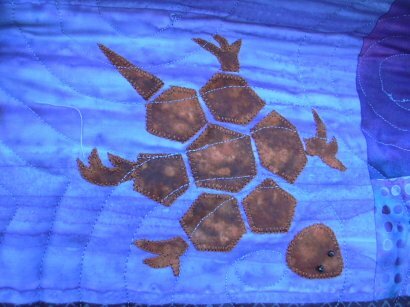 “As I made this quilt, I knew I wanted to make it with many levels of understanding. Like a ruby, she is indeed a woman of multifaceted dimensions and strengths. Claire and I learned together about colors and the symbolism color provides humans in their art and psyche. Let me explain the design of each side of this quilt. How could I not start in the center with math? I used a pattern called Harmonic Convergence based on the Fibbonacci seguence (addition of one half, one, one and a half, two and a half….always adding two together to get the next. 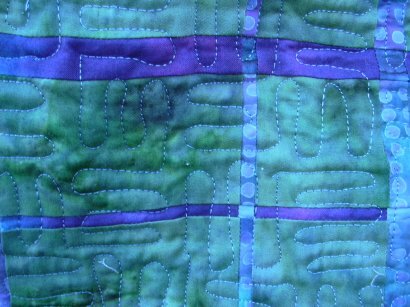 Strips of fabrics blend the blues of air and water, greens of plants and growth, purples of royalty and prairie-clover intermingling as they do in life. 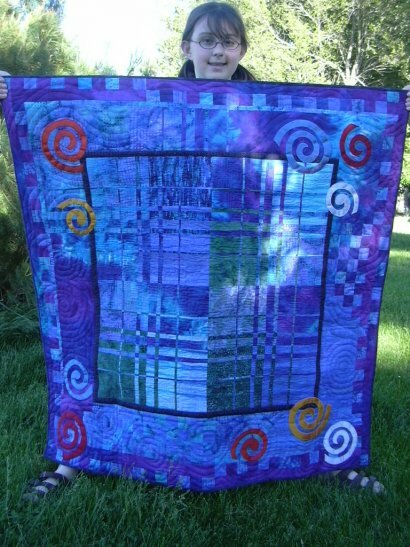 The outer border of this quilt is heavy with the tie-dye purples and blocks of color. 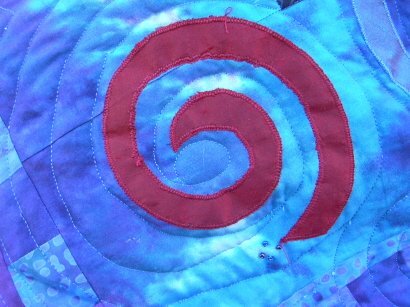 The bright spirals of vivid color intersect the main and border sections of the quilt. Often called life spirals, these ancient symbols add a uniqueness all their own. These silks came from shops of London specially to add to Claire’s quilt. 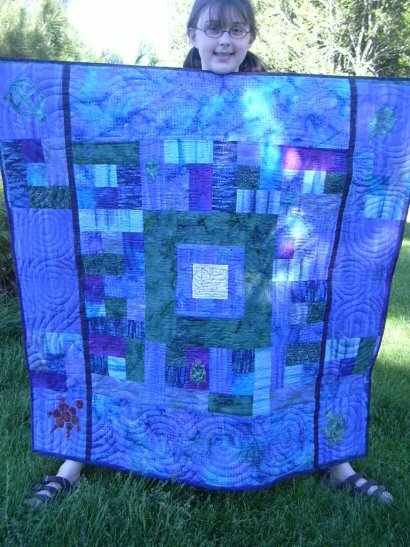 The reverse side of the quilt is made of blocks using various colors in the log cabin pattern. Molly has been a great mentor. I’ll never be able to thank her enough for this precious gift that I’ll treasure always. Tonight we had the final ceremony for Coming of Age(COA). I learned a lot through this experience. Every participant chose a mentor. My mentor was Molly. She was a great mentor to me. We had three retreats and monthly forums. I learned a lot about myself and what I believed. I wrote a poem for Molly and got some pictures of us and put them together in a frame to make a collage. I gave that to her at the end of my speech. We each (all 25 of us) had five minutes or less to talk about general things we learned, the program, and our mentors. At the third retreat, last weekend, the mentors spent more then two hours coming up with names for us. My name was Ruby Skipper. The reasons, as Molly said are, ruby-a precious gem with many facets, the ruby slippers that took Dorothy home. 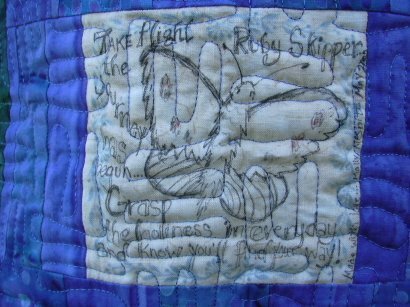 Skipper-a beautiful butterfly that travels great distances, the captain of my ship as I travel the river of life. I love my name. 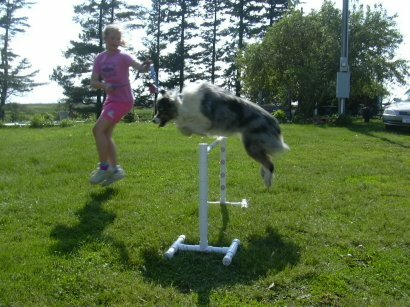 Blue is a very fast and strong dog, so this jumping is no sweat for him, even the highest rung. 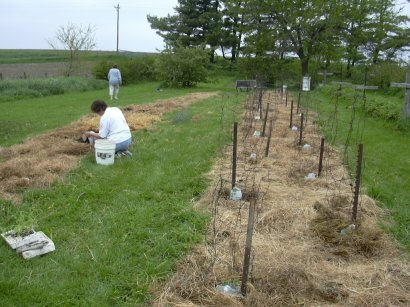 Got a bunch of tomatoes and peppers planted in the straw that will become next year’s raspberries. All the cages are up and the plants are ready to go.